The great desert of Jakku conceals the remnants of the Empire’s defeat, the great hulk that used to be the Imperial Star Destroyer Inflictor. We’ve seen this setting in LEGO before, but this new take by kofi looks magnificent. The smooth sand dunes created with tan tiles and curved slopes give the Inflictor heft, making you feel as though it really buried itself into the ground as it crashed. 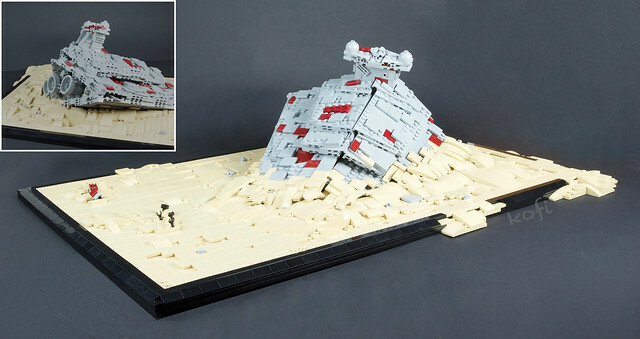 Be sure to check out these other interpretations of the crashed Star Destroyer on Jakku, including the amazing model that won our LEGO Creation of the Year award for 2018. The Star Wars saga is all about two things – machines and locations. Of course, some may say it’s also about the Force, family relationship and friendship, but none of this would work without iconic spacecrafts and mesmerizing sceneries. 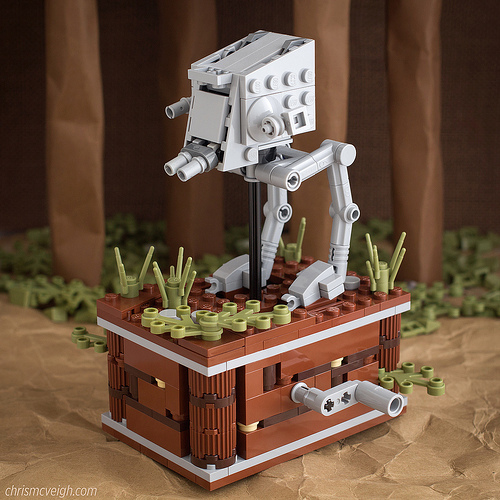 Chris McVeigh reveals a very special collection of three vignettes featuring our favourite pieces of machinery. But what is absolutely cool about these builds is that each of them has a motion feature, which brings an AT-ST, the Millenium Falcon and an AT-AT to life with a simple turn of the crank. Click here to see this adorable collection of moving models!